These are always logged to the $SYS topic and can be accessed using an MQTT client subscribed to the $SYS/# topic. System status logs are always enabled by default, and cannot be disabled, as far as I can tell. Different brokers will provide different $SYS log topics. This Github page has a list and description of the $SYS log topics split into optional and required. These provide detailed information about clients, and client broker commands. Using them you can see which clients are connected, subscribed etc. Logging is configured in the Logging section of the mosquitto.conf file. You can choose which event types to log, by default error, information, notice and warning events are logged. For debugging I use log_type all. Here is a screen shot showing a client connect, subscribe and disconnect sequence and the console log messages that are generated. Note: On Windows logging is disabled when starting mosquitto as a service. This is because the broker is running as a background process and has no console attached. You can log messages to multiple destinations. For example you could send log messages to the console, to the $SYS topic, and to a log file. You can also disable logging using the log_dest none option. 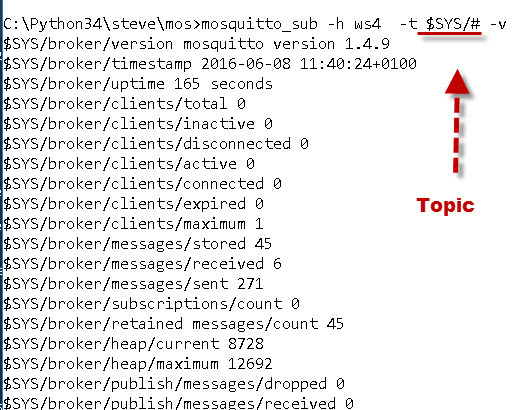 Normally you will view these logs on the Mosquitto broker console but you can also view them using an MQTT client if you have logged them to a topic. If you send the log messages to topic they are sent to the $SYS/broker/log topic ,and you need to subscribe the topic tree $SYS/broker/log/#. Can I see all connected clients? Can I list all topics? The broker dowsn’t let you do this directly but by enabling logging to a a topic and monitoring the topic with an MQTT client you can get a good idea. To view the system status logs you need to subscribe to the $SYS topic using a MQTT client. You can use the mosquiito_sub client that comes with the broker as shown below. In the screenshot below ws4 is the broker name. You can also use the Paho MQTT Python client see subscribing to topics. Q- Are $SYS logs saved to disk? Q– Why Do I get the message: error: unable to open log file /var/log/mosquitto/mosquitto.log for writing. A- This is a permission problem and is caused when you start mosquitto manually. You can either start mosquitto as root using sudo or when test change the log file location to your home directory. Q- How can I list All topics? A_ Mosquitto doesn’t provide this functionality by default but you can use topic logging as discussed above. Q- How can I list All connected clients? Q- Can I use the $SYS logs for monitoring the broker status? The mosquito logging explanation really helped. With this and other info I was able to get mqtt messages running (with a Raspberry Pi acting as the server) to and from a PC with a client running in Processing. Also a client running in Processing on the Rpi. Now moving on to interfacing multiple Arduinos to all this and probably more Rpi’s also . Mosquitto has run flawlessly – I just needed logging to see how to make the initial connections. Do you happen to know if more admin-level functions are logged as well, such as changing files the broker would use for ACLs or usernames and password changes through mosquitto_passwd? No there aren’t as far as I know but it could change as I know that it is being upgraded for mqtt v5 and that might contain additional features. Any chance to show the content of the message published on the websocket?. I have looked everywhere and can’t find anything called the “Mosquitto broker console”. Other than ‘sudo cat mosquitto.log’, is there a better way to see the log file? When you install mosquitto on linux or windows it is configured to start as a daemon or service. This means that you can’t interact with it. However if you start it from a command prompt then you will have a console were you can see the log messages. The log file is probably in the var/log/mosquitto folder and you can open it with a text editor but you will need to change permissions. 1503843648: Error: Unable to open log file log.log /var/log/mosquitto/ for writing. I use Ubuntu and permission of log file is 777.
and when I subscribe to $SYS/broker/log/# it just sends subscribe logs but I want to receive publish log, connection log,… exactly like stdout. It seems publish messages are classed as debug messages which you can confirm by not logging debug messages and then publish messages don’t appear on the console. Debug messages aren’t sent to the topic so you will never see them there but you should see connection messages. your url is refer to this page that we are inside it. I read this article,but its not clear for windows at all. I could use “log file” only , but “console log” and “topic log” does not work at all. what do you mean from the above line? I have mosquitto logging for quite some time to a single log file on my cents server. What I would like to do is log to a new file each day with a date-stamp as part of the filename. Not as far as I now. You specify the name in the conf file and it only accepts a file name. You would need to use a script to read the log file and create and move the log data into the files. So in the windows we can not enable logging? I saw the mosquitto.conf file also and there is not “log_type all” expression! When you start mosquitto as a service it can’t send log messages to the screen as it is running as a background process. You can edit the conf file and log to a file.